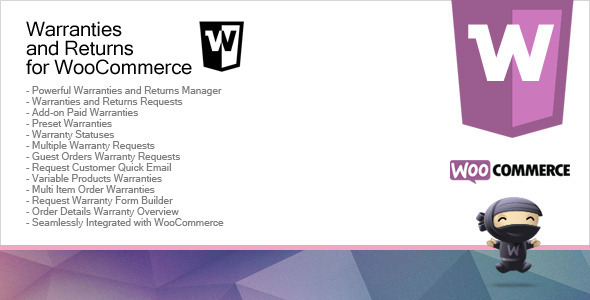 Warranties and Returns for WooCommerce! The ultimate warranties and returns management system for WooCommerce packed into this great and easy to use plugin! Best value! Easiest manager available. Manage requests in just a few clicks. Get requests from your customers. Create custom request forms! Create paid warranties, as well as included. Unlimited possibilities! Create preset warranties for easier management. Use thumbnails and warranty desctiptions. Easy request statuses. Manage statuses in single click. Enable multiple warranty requests for your items. Once the previous warranty is complete the next one can be requested! Guest orders can also have their warranties requests. Guests will use order ids and their email for verification purposes in order to make a request. Quickly send emails to request customesrs. BCC and Email templates are available! Variable products are fully supported! Manage multi item order requests in one single parent request! Create your own request forms! Drag and drop editing. Easy warranty management for your customers. You wont know it is there! Seamlessly integrated in the interface for the best experience!